With more than 6000 Twitter "followers" and 100,000 views on my blog I am many times more famous than I ever dreamed I'd be—though far less rich. Of course, for the most part, my Twitter fans are Israeli spammers, but I'm also a pretty big online deal with Turkish bots. I'm virtually a superstar, but it's entirely possible that I am my only actual fan. Still, I enjoy the illusion that I have achieved; that I created something of value and that the proof lies somewhere in those numbers—or at least, some fraction of those numbers. Possibly, a single digit. (Thanks, Mom!) But it feels like something akin to validation though this may just be my personal version of clapping for Tinker Bell. About forty years ago, I read a science fiction novel which predicted a future in which every individual was incorporated. I remember thinking that the idea was as ridiculous as bottled water. Turns out, I was right, but things did not play out as expected. Bottled water is now commonplace and almost every individual is very clearly selling something; their imaginary lifestyle, their "perfect" relationship, their exciting job, their trendy lunch or some product or service. Need proof? Next time you're stuck in traffic, check the neighbouring cars. A large percentage will bear magnetic advertisements on their doors, stickers in their windows, or at the least a bumper sticker: Proud Parent, I Love NY, Trump for Ex-President 2017, stick-figure family—including pets and ex-wife. I get it. I'm a writer. 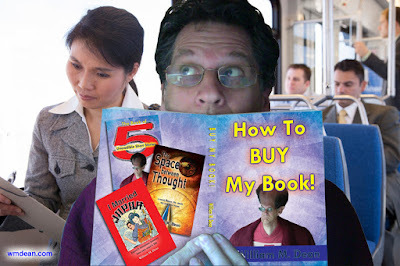 I'd love to sell a book or two. And I know that I should be relentlessly shouting the news to anyone who will listen. But I just can't make myself spam the world or beg my friends to read my stuff—in fact, it's best they never find out that I write about them. I am also aware of the flip side of writing which is a sort of pyramid scheme in which you achieve the dream by selling the dream. 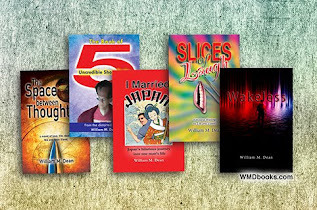 But, I have no urge to use my books as a pedestal from which to preach writer-gospel to fellow struggling writers. If I were to offer a course to writers, it would not be inspirational. 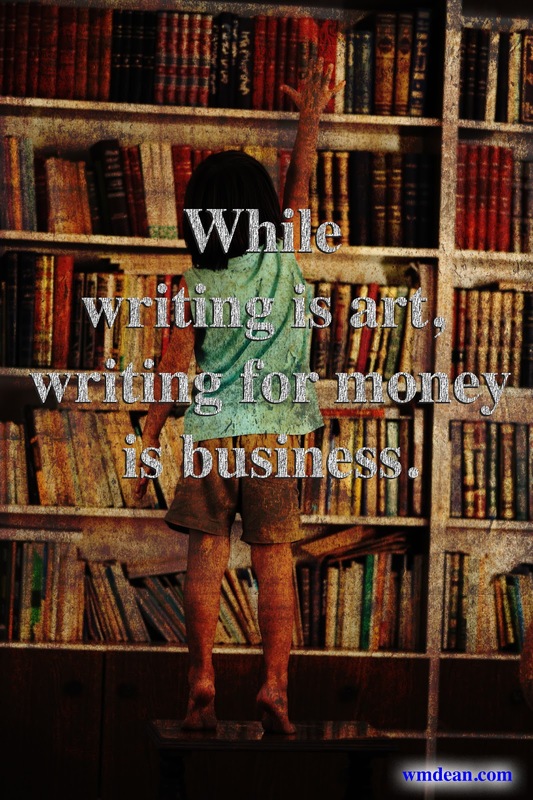 I'd start by telling them that writing is all about personal gratification through a largely imaginary lifestyle, and definitely not about money. I'd add that it's going to cost them time, energy, probably a relationship or two and some of that money that it's not about. No book is ever going to spontaneously generate an income, or if it does, when you look back you will decide that it was not worth the time and effort. Your ascent will be a long-tailed curve of sacrifices through which you emerge less a victor than a survivor. If, after hearing all this, they still want to be writers, then I would congratulate them, because they already are. True writers have no choice but to write. After that, it might be fun to award coffee mugs which are equally suitable for alcoholic beverages and receiving charitable donations—or maybe ascots. The writer's lifestyle that most of us imagine is a stress-free, peaceful existence with loads of idle time spent basking in the validation of our fans and admiration of our peers—oh, and debt-free. Well, I have kids, so for me, the first two items are non-starters. Both the word "basking" and the word "fans" seem hyperbolic. And so few would admit to being my peer that admiration is unlikely. I am debt-free—but only briefly, twice a month, when I get my day-job pay cheque. Well, one out of five ain't bad. Great news: I've achieved 20 percent, and it only took two-thirds of my life! The future looks... inadequate. 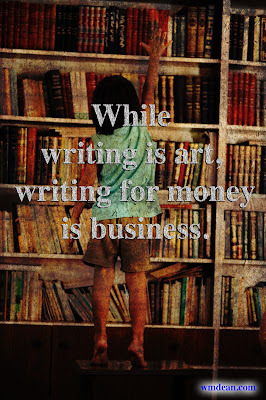 While writing is art, writing for money is business and the sad fact is that, for most of us, the stuff that sells is not very satisfying to write—it is not literary music and does not expose deep truths. The vast majority of money-making, popular materials are either products of the social media echo chamber which knows what you like and what you like to believe and rehashes it through popular memes, or ones that seek to play seeing-eye-dog to our blind ambitions, usually premised on exaggerated claims bent on luring us out into rush hour traffic. If, by chance, you're already a popular writer, then you've gotten a grasp of the game and become good at it. Generally, that involves volume, because an endless supply of product is what keeps the money flowing. Money, itself, is of much less value than people think; it's the rate of flow that measures success. The reality of being a popular writer is not the lifestyle you are probably imagining—it's a lot less time spent stringing beautiful words than coaxing a mundane concept into too little space, or sacrificing eloquence in order to save content, or chugging out credible-sounding drivel because that's what really pays. The most successful writer I know, personally, creates top-ten-style websites based on Google search requests. He picks a popular search topic, writes what is basically advertising material that sounds like first-hand advice and adds pictures with links to the products. He collects a few cents every time his material inspires someone to click one of the links. If they actually purchase a product he gets the equivalent of me selling ten paperback books. In a single month, his writing generates more than mine does in a year. They say that if you want to be successful you have to want it "bad enough." I have found this to be very true. I never wanted anything bad enough to do what many of the more successful people around me were willing to. I've never wanted to risk anyone else's money, talk up a product beyond realistic expectations, make promises I couldn't keep, or sacrifice my health. Of course, I did all of those things, but only for the first few years after entering the job market. Those I know who did not alter course have been financially rewarded. I'm not the least bitter. I would have done the same if I could have ignored my core beliefs. I blame Walt Disney who, ironically, built his empire feeding people like me a hobbling set of core beliefs. As we age, it's more difficult to achieve success because the accumulation of knowledge and experience tends to yield self-awareness and empathy which is akin to tossing a juggler an anvil. No longer blinded by ambition, we become less able to exaggerate, manipulate, gouge or steal and still hold our heads up. We may still feel the urge to climb that social ladder, but now we are hobbled while those younger and brasher step on our fingers in their rush to the next rung. If they're lucky, they'll only regret this much later, while poolside, sipping margaritas. In my own days of youthful ignorance, I made quite a bit of money. At twenty-seven, I was bringing in $60,000/yr. 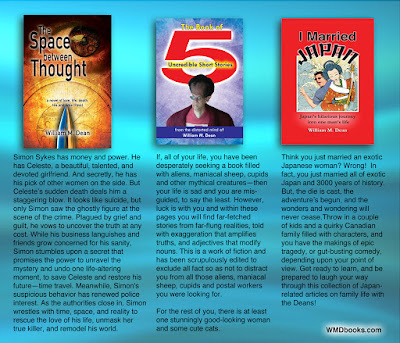 (Cnd$) as a publisher. My wife, at the time, was doing equally well and together we quickly built a small empire. When I look back at what I had to do in order to manage my staff I now see much of it as manipulating, lying and cheating. I could never do this today. In fact, I wasn't really very good at it, even back then. At thirty-five I chose to step out of the management stream in which I had been paddling. For about fourteen years I sold sandwiches which I saw as the least harmful thing I could possibly do. The product was food and the choice was simple: You either wanted a ham and cheese or you didn't. I didn't have to convince anyone to buy. And I didn't have to sacrifice my health because it was physical enough that it provided a decent workout, four hours a day. Oh yeah, and it was only four hours a day! I truly enjoyed that job. Since then, I have accumulated many more assets, but that was the time in my life that I felt the most satisfied with my lot. All I ever wanted to do was create something cool without doing any harm and maintain a living while doing it. A pretty modest goal, twenty percent of which I have achieved. The only element completely missing is validation. And, even more than money, I think that is what most of us are desperately looking for. I clearly understand the need, but I get tired of being sold to. 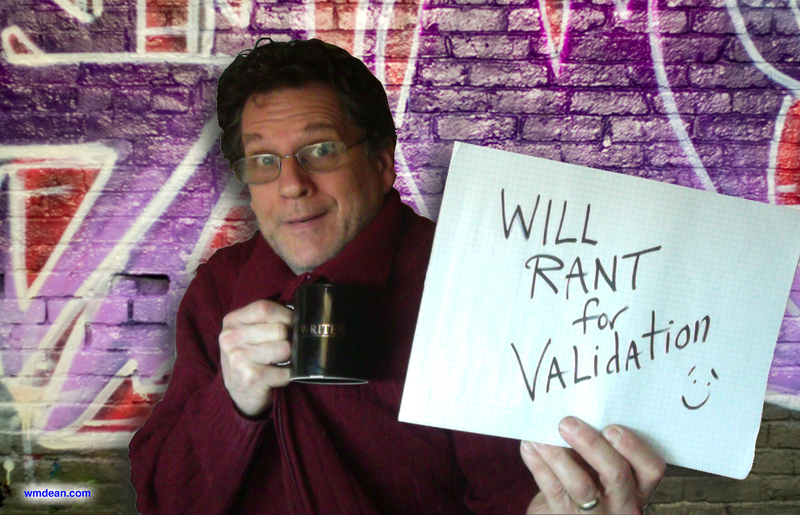 Everyone wants my validation or my money so that they can purchase the validation of others—or they want both. It used to be that to escape the sales pitches all you had to do was leave the mall and shut off your TV. These days, you have to stop communicating with your friends, as well. I guess I'm no different. My writing is my product, but it is also my advertisement. But, I have to write. In fact, I can only suppress the urge for a short while before my mind seems to become fragmented, I feel anxious and ungrounded. At that point, I must find a keyboard, a pen and pad, or write in blood on the back of an envelope. This is how I stumble my way back to a calm. I am not the least encumbered by the fact that I might have nothing to say. I guess we call this "writing" and not "informing" for the same reason that we go "fishing" and not "catching." A few weeks ago, my wife felt that we were drifting apart. She wanted us to start having tea together, for about a half hour, each night. I jumped at the offer because, first of all, it is atypically romantic of her, and secondly, I thought there might be biscuits. Well, three weeks later, the romance has worn thin, the half hour lasts about an hour and a half and our discussions are teaching us that we don't agree on as much as we thought. Also, there are no biscuits and I now have to get up at 3am to pee. Tea time has all but eliminated my writing time and my wife is so much more devious than romantic that I have to wonder if this was not the actual intent. She's always seemed very supportive of my writing... but that's exactly what a devious person would want me to think. Argh! I am fragmented, anxious and ungrounded. And this is entirely why I had to write tonight, without any topic in mind. Even though I do wear a cardigan, maybe I'm not actually a writer. Maybe I'm just a rant-addict selling myself as a writer. 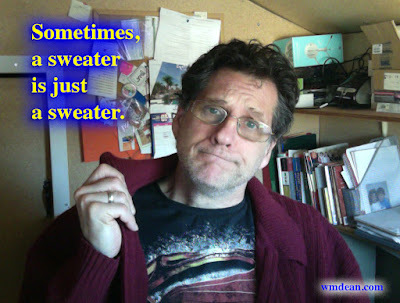 Sometimes, a sweater is just a sweater. Regardless, I anxiously await your validation. Addendum: It's 3am and I had to get up to pee. It's not such an inconvenience. Tonight is one of those nights when my mind is churning and sleep is fitful. I'm feeling creative; I grab a pad of paper and proceed to the toilet. I'm scribbling away with my favourite pen when the cap pops off and falls between my legs. Plop! Before the last ripple settles I deftly pluck the top from the urine and toss it across the room and into the sink, impressed by the cat-likeness of my reflexes and the deadliness of my accuracy. Then I remember: Earlier today, I was teaching my daughter about how her hair clogs our sink and I removed the stopper. It's 3:30am and I am disassembling my bathroom sink to retrieve the cap to my favourite pen. This is a writer's lifestyle.